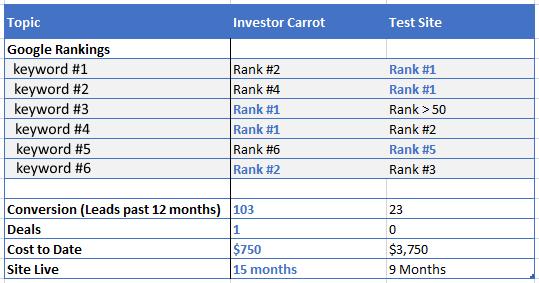 My Blog Investor Carrot Review, Is It Right For Your Wholesaling Business? Investor Carrot Review, Is It Right For Your Wholesaling Business? Over the past year I’ve been asked all kinds of questions about my experiences with Investor Carrot. When I first discovered them I had a lot of questions myself and found it hard to find the answers. At the time Investor Carrot had just launched the service so there was not a lot of information out there. I just had to take the plunge and hope for the best. I’ve had my website up for over a year now with some good results. From my experience with the website service I felt I had enough knowledge to put out an in-depth review. I tried to cover all the questions that I had in the beginning and also all the questions that I’ve been asked. Update 2016: I wrote this review about 2 years ago and I wanted to now come back and update it with my experience since that time. I’ve added a few new sections as well as put updated information in existing ones. What do you get with Investor Carrot Websites? What the Initial Setup of your website is like? What are the Content Packs? After a Year, How many site visitors did I get? How well do the sites convert? How long did it take before I started getting leads? How many deals have I gotten? As you go through my review I’ll have videos of the front-ends and back-end of my sites that will give you a full understanding of what Investor Carrot is all about. It’s more then just a Template based product, it truly is a system. What do you get with an Investor Carrot Websites? A well designed website based off of the WordPress platform For anyone who has used WordPress to develop a website/blog you know how easy and powerful it is. Investor Carrot doesn’t use the full capabilities of WordPress but is a customized version that is geared towards real estate investors. Another reason for the customization is that they can control what plugins are used. This is good and bad. I explain why later. Customizable, Pre-Written content. I love this because it meant that I didn’t have to spend tons of time writing content just to make my website look legit. Now they don’t write the content just for you, they have a growing list of templates that they use (The Pluses and Minuses of this later). There are two ways this content is customizable, (1st) it automatically uses your target area, business address and phone number through it’s content. Think similar to how mail merge works in Microsoft Word. (2nd) You can change the pre-written content however you wish. I chose to reword much of the content to make it more unique. The content is also very well optimized for search results. I know a thing or two about SEO and let me tell you I’ve learned a lot more by seeing how my investor carrot website does things. Contact Forms. You can tell that the investor carrot team did some research and testing because of this feature. On my site there are 6 contact forms that are placed throughout the site. Each used to convert different types of motivated sellers which I like. My favorite part though is that after filling out the initial short contact form they are then forwarded to a more in-depth contact form. I rely on this full contact form information to help me weed out the motivated sellers before even talking to them. Downloadable PDF Guides. This is an underrated feature in my mind. These are informational PDFs talking about things such as “Pros and Cons of dealing with an Investor” and “5 Ways to Get Out of Foreclosure”. The purpose of these forms is to get sellers who are on the fence to submit their information to you in order to get the guides. Now they are in your pipeline so you can follow up them. Custom Templates for Showing Properties. A cool feature that helps to show your buyers the houses you have under contract. I’ve only experimented with this feature but what I liked is that it was available and I didn’t have to create my own template. I tend to put things off if I have to think about it to hard. Thinking takes a lot of energy…you know. Squeeze Pages. Squeeze pages differ from regular posts and content because they are strictly used to get people to sign up for something. Investor Carrot supplies you with 4 (that’s what I got) already created squeeze pages. They are used for your downloaded guides as well as property information forms for motivated seller who want to get a “quick offer”. You aren’t limited to just those lead pages, you can create as many as you like. I’ve messed around with them a little and they are very customizable as well. Testimonials. Just like the property section, there is an area where you can add testimonials. If you are a serious investor, having testimonials on your website will give you huge social credibility. Customize the appearance. One of the drawbacks of investor carrot “out of the box” is that it looks just like all the other Investor carrot websites out there. However they provide you with an endless amount of customize options so you can change colors, fonts positioning, pictures and more. I did not touch these options very much but I may in the future. In the behind the scenes video I’ll show you all the customize options. Additionally they even provide 4 different Themes for your entire site. This is a quick way to make your site look different. I’ve stayed with my original choice but I can see the value of this for people just signing up. It’s always good to modify your content some what to make it more unique. Like I mentioned previously, the prices about doubled since I signed up 3 years ago. I talked with Trevor about this and they found that they needed to adjust the packages and raise pricing because they wanted to make sure that they serve there current and new customers better. I can totally understand this. Every website is created based off templates. With over 900 current subscribers and climbing it increases the chances for duplicate websites in a given region. Duplicate content could kill your search rankings. All of these packages have hosting included. That is usually $7 to $10/mo by itself. All of these packages are full service. The only thing you have to do yourself is get a domain name and point it to your new website. Which package do I recommend? When I first signed up for Investor Carrot back in June of 2013 the prices where about half of what they are now. I started off with what is equivalent to the Pro Package. At the time I paid $49/mo for 3 sites. That was a STEAL! 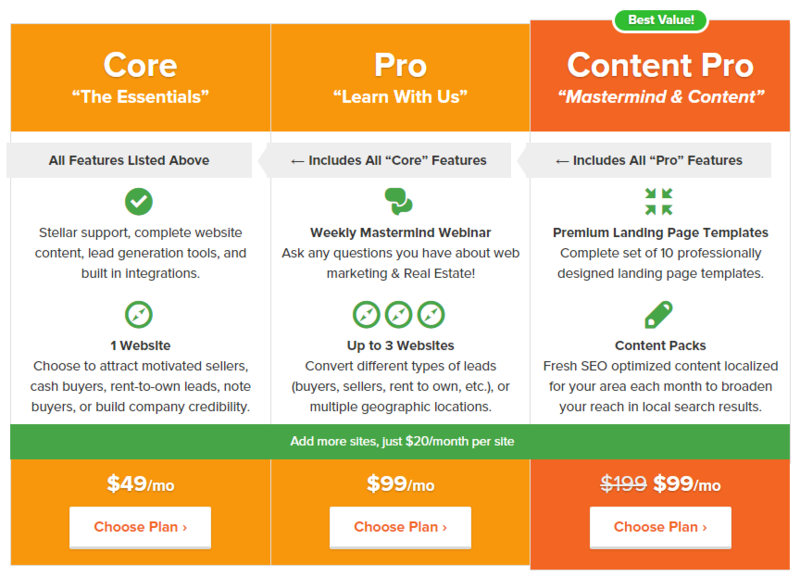 I recommend the Content Pro (Mastermind & Content) package for $99/mo. Even if you only need 1 website, the real gold is the weekly mastermind calls and the extra content that you get. Trevor and his team are just top notch when it comes to their education material for members. What is the Initial Setup of Your Website Like? This information will then be used throughout your websites. The video below was put together by Trevor Mauch (founder of Investor Carrot) walking you through the setup of your website. For certain when you get your investor carrot website up and running you’ll want to make some modifications, add Google Analytics, edit your contact us page, edit navigation menus or any other random item. 70 Tutorials for setup, customizations, writing content, squeeze pages, getting traffic and more. The best way for me to explain what they have in the support system is just to show you. So here is a video walk through of what they have. When I signed up 3 years ago I was impressed with the help and support area. Taking a look at it for this updated review has really showed me how much they care about their users success. They have really spent time here trying to make it the best they can. It’s so much easier to navigate and find what you need help with. What are these Content Packs? If you sign up for the Content Pro package you will get access to Investor Carrot’s pre-written articles. With this access you can schedule these articles to be published to your site on a routine basis. While these articles are all Templates and everyone who has the Content Pro package has access to them, it is an excellent way to keep your site active. The largest group of articles is for attracting seller leads. I wanted to show you a quick video on how to use the content packs. Great feature though if you schedule them to go out to often you will run out. Hopefully they keep pumping out the articles so that doesn’t happen. My review is below, but before you start reading I recommend you take a look at the investor carrot website. Take a look at some of the testimonials and take the tour. By now you should have a pretty good idea on what you get when you purchase an investor carrot website package. Now I want to give you my experiences and thoughts. I found out about Investor Carrot after buying an SEO course called Real Estate Commando Lead System by David Corbaley. Great course, but I just didn’t have the time to spend on it. I like communities and this course included membership to a Facebook group. I was reading some of the threads one day and found one talking about OnCarrot websites…This could be for me! There were a lot of good opinions so I went and checked it out. Coincidentally OnCarrot was being converted to the new Investor Carrot at the time. I’m not sure what it was before but I think it was strictly a template you’d buy (probably the first evolution of what we see now). It was an easy decision to give them a try because at the time they had a $1 for the first month promo. This promo was for the 3 site package as well. I handed over my dollar and jumped right in. This is the gods honest truth…I was down right giddie with excitement the first time I saw my new websites. My excitement even grew after clicking through the pages and forms. You could tell there was a lot of thought, testing and time put into how everything worked together. I’ve read a lot about creating websites, SEO and conversions. Many of the concepts were used in the website. From the placement of the contact forms, the free PDFs, the calls to action and the proper SEO strategies. One of the first things I did when I got my site was to point my Godaddy hosted domains to the Investor Carrot webhost. This was very easy to do and once pointed it took about 24 hours before the internet picked up the change (this is typical). I knew how to do this but followed the Tutorial on Investor Carrot for Godaddy domain redirect. Uploaded My Company Logo. The default is a Text Logo with your company name. I had already used Fivrr.com to create a logo for me so I uploaded that and replaced the Text. This was very easy to do. Reworded the Articles. This is where the heavy lifting began. I was a little worried about duplicate data with Investor Carrot websites since they come from templates. I talked with Trevor Mauch (Investor Carrot Founder) extensively about this and the only worry would be if you don’t change your site and there is another member in your direct target area. Other wise they have not seen any evidence of being penalized. Even with that small chance I decided to reword much of the content on the site. It was nothing drastic and I pretty much kept the exact layout. The one thing I made sure to do was to keep the Keywords that the articles were based on. I didn’t want to mess with those and risk harming the future rankings. The rewording of the content took me about a month. It was not an enjoyable task by any means. Added Content to The About Page. This should have been the first thing I did because its one of the most visited pages on my site. Funny enough I just found out that I had forgotten to redo the about page on my Seller Leads website. Its been like that for a year…Crap! I wonder how many leads I lost because of that? Added 20 City Specific Pages. After talking with Aaron (Investor Carrot SEO manager) and Trevor, they recommended created separate pages for cities in your target market. These pages should not be exact duplicates of your home page. You should change up about 20% of the content as well as change the target market. For me my target area is New Jersey, so I came up with 20 cities in NJ that I wanted to micro target (Morristown, Phillipseburg, Trenton,etc…). I then made exact copies of the homepage and for each replaced every where that New Jersey showed up with the city name I wanted to target. I then just rewarded 2 paragraphs on each and that was it. Created Offsite Citations. Citations are basically company listings in the yellow pages, but on the internet. You find directories that list local business and setup accounts with them. Some are free and some are paid. Investor Carrot has a service to do this for you, but I chose to use a company called Moz. (https://moz.com/local/overview). This is all I have done to my sites. There is a lot of SEO and conversion tactics pre-built into the websites so any additional work should be geared towards offsite SEO. I’ve used WordPress for my StrugglingInvestor blog for 7 years now…I’m familiar with it. When I first logged into my Investor Carrot websites I was pleased to see that it was built on the WordPress platform. For those that have used WordPress before you know how user friendly it is. After a Year, How Many Site Visitors do I get? The first part of getting leads from a lead generating website is getting traffic. Make no mistake, just like all websites, my investor carrot websites took about a year before I really started to see a decent amount of traffic. As websites Age, get indexed (found) by the search engines and backlinks get created your site will rise in the search engines for your targeted keywords. Your site will top out at a certain point because your competition might have a stronger SEO Profile. You might top out at #3 or #20 (last on 2nd page). That’s okay, it just means you are going to have to put in some more work to pass them by. For my main keywords I’ve topped out in the top 5 of Google search results. This is awesome! Now I need to start working on getting all of these to #1. How I do this is for another article. Update – Since about the start of 2015 my site has been either #1 or #2 for my main keywords. The site i’m up against is also an Investor Carrot website. Looking at my Google Analytics over the first year of my site, we can see when my site hit the first page. It’s easy to tell because that is where my traffic really started to rise. You can see that my traffic has been steadily rising. The steady growth is related to other keywords that I’ve been adding along the way. These keywords are not my main keywords, but none the less drive traffic to my site. Getting visitors to your site is worthless unless you can convert them to leads. I have to admit that these sites convert very well. Over the first year of my Investor Carrot site, I had been building up a non-investor carrot website for testing purposes. I hired an SEO guy and a Content creator to help build out the site. This site also ranked in the top 5 for the same keywords over that period of time. The traffic is similar but I got about 5 leads (from the Investor Carrot site) for every 1 lead from the test site. Over the last few years, the idea of having a 2-step contact form has been introduced and tested…and the tests are returning fantastic results. Dale Carnegie once said… a small yes leads to a big yes. A site visitor who commits to filling out that short contact form is much more likely to complete the longer contact form afterwards. Renown online marketer Neil Patel of QuickSprout.com wrote a great article about how getting your visitors to invest a little will turn them into customers. He calls it The Hoop Theory. Once a person fills out the initial contact form the system is setup to send a personal email. This email looks like it comes from your smart phone and contains some follow up questions. It also asks when the best time to call them would be. I’m surprised at how often this email is responded too with useful information that better qualifies the sellers. 2 forms to download guides (Pros, Cons and Pitfalls & Free Foreclosure Guide) for leads who are in the beginning stages of selling. 2 forms setup for leads who are really motivated (Sell Your House Now & Need to Sell Fast). A form to contact us if they have any questions at all. Take a look around their site and see if you have any other questions. If you do leave me a comment and I'll do my best to answer based on my personal experience with the product. This is a very good question. If you build it…they will NOT come. At least not right away. Over the first 4 months I could count all the leads I got on one hand. It took a good 6 months before I started getting about 5 leads per month. This lasted for another 6 months before the leads started picking up. Here is a quick chart that shows the leads/mo over the first 11 months (The chart starts with the most recent month…July 2014). 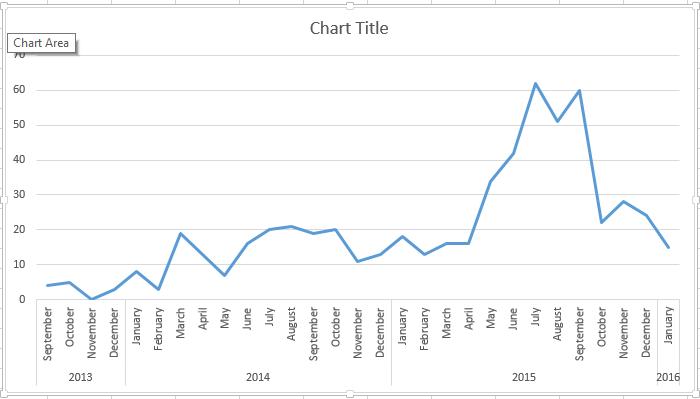 As you can see I got a HUGE spike in leads in the middle of 2015. I am not sure what caused that but it was nice to get. It doesn’t really correspond to my traffic so that doesn’t explain it. Have I gotten Any Deals? Anytime I’ve ever been asked about Investor Carrot websites the first question I get is…How many deals have I gotten? This is a valid question. I got 1 deal in the first year, but since then I’ve gotten 7 more. I have gotten a total of 8 deals from my investor carrot sites. Can you guess when my first deal came? Yup…From a lead I got in March 2014. My partner and I netted about $5000 from that deal. Easily paying for the next 2 years of my websites. If you’ve read the entire article up to this point you won’t be shocked when I tell you that I LOVE my investor carrot websites. If it were not for these sites I would not be actively wholesaling right now. When my wife lost her job in the summer of 2014 I could no longer afford to send out direct mail. Having these websites is my sole lead generating method at the moment. And it works very well! It honestly took me 3 months to get my Test website (webuynjhouses.com) up and running. In 2 days I had 3 investor carrot websites up and quite frankly they looked and performed better as well. I like them so much I am an affiliate for Investor Carrot, but this is the honest truth. I really like the looks of the site. My good friend Sharon Vornholt (who also has a website through IC) thinks it’s a little to manly looking, but that might be the reason why I like it so much. What I mean by this is that each page plays off the others very well. There is a purpose for everything that they include. Testimonials, Downloadable Guides, smartly placed contact forms, and great content based off of good SEO strategies. They use Gravity Forms as their contact form plugin. This is a $40/yr plugin and is excellent. I chose this same plugin for my test site because of it’s flexibility, power and ease of use. Also the use of a 2-step contact form really improves opt-ins. The first form only asks for minimal info (name, address, phone and email) and the second form gets the rest of the info that you will want. In addition to all the tutorials, they hold weekly training webinars for members. These webinars are not for selling, but strictly for teaching members how to better their conversions, increase traffic and much more. Trevor really puts a lot of attention towards his current members. When I signed up last year the price for the 3 site package was $49/mo. Even though they have doubled their pricing I still think it’s a steal for all you get. Keep in mind this price also includes the hosting of your sites. In comparison my test site (with hosting, highered SEO guy and Content writer) has cost me over $2000 to get it up and running and $350 /mo on going. I love WordPress and the fact that Investor Carrot is built upon that platform makes it a cinch to manage. They obviously don’t custom create your site and write unique content just for you. They use templates. I’ve spoken to Trevor about this and he has said that they currently have 4 templates you can choose from. He also said they are adding more and retiring others. This alleviates some of my concerns but I still felt the need to reword a good amount of the content. Because they use templates there is a possibility that another person in New Jersey could have an almost identical site as mine. Google will not like this and punish both sites. Trevor recommends that once you get your sites that you personalize them more and reword the content somewhat. It took me a month or two to do it for my 3 sites. I’m a bit of a control freak and tinkerer when it comes to my websites. I like to have access to my sites on the hosting level. You don’t get that with IC. They do that for a reason. It prevents people like me from messing something up. I know just enough to create a lot of problems 🙂 Still I’d like to have access to the Host. If I do a general search for “We Buy Houses ” I can almost pick out all the Investor Carrot websites from their default Meta Title and Description. Also if you go to the websites you’ll quickly notice which sites are IC sites. Let me say though you do have the ability to really customize the look of your sites so they don’t look like all the other IC sites. I recommend you do this to at least your homepage so your site stands out from all the lazy people out there. I mentioned it a few times throughout this post. For the first 12 months, along with my Investor Carrot sites, I been built a Non-Investor Carrot website. I’m doing this for a number of reasons. Firstly, I wanted to directly compare a website built from scratch by me to the IC Websites. I hired an SEO expert to help me with ranking my site and I also hired a copy writer to create content. Working with these people for a while now I can honestly say they are great at what they do. Second reason is that I wanted to learn more about SEO and the process of ranking a website. This would help me better analyze the Investor Carrot websites and to understand their SEO strategies. Lastly and simply an added bonus is that I don’t have all my eggs in one basket. If anything happens to either site, I’m not shut down. Also I could take either site and focus on completely different markets. It’s a good position to be in I think. These rankings are from after the first 12 months of both sites. I have since put all my focus on my Investor Carrot site and have not touched my self built site. In short…I’m a big fan of Investor Carrot! I’ve spoken with Trevor many times for any problem I may run into or just to ask him a general question about the Pro Package. He has always responded personally or had one of his team members get back to me quickly. These websites are top notch products that have even improved since I signed up over a year ago. It’s unlike any other Investor website services I’ve run into. If you are looking to get a website up and running quickly give these guys a try. As of this article they are offering the Pro +Content Package for $99/mo. That is $100/mo off the regular listed price. I don’t know how long they plan on offering it at that price but I upgraded my plan to that yesterday. As I use a product over time it’s a great sign when that product continues to evolve and get better…and not charge you extra. Investor Carrot has been awesome in that regard. Since this review 2 years ago I have noticed the following about Carrot.. Improved support – They have added support staff to their team as well as easier ways to contact them when I have a question or an issue. When I recorded the signup video (new for this review) I got an email the next day asking if I meant to create that new account. The reason was because I already had an account and just upgraded to yearly billing. That’s good service in my book. Additionally they have continued with their weekly mastermind calls and the topics are always useful and current. There are many times where the topic of the week was something I was just thinking about. Not sure how they managed to do that. Always Looking to get Feedback – I routinely get emails from Trevor or a member of his team asking for my feedback about a feature. They also share with me their ideas for the future and my thoughts on that. Makes me feel like I’m a part of the team and community. More Competition – The number of Carrot members over the past 2 years has exploded! For many of my keywords the top 10 are littered with carrot sites. This just goes to show you how well they work. It also emphasizes the need for you to work on your website and do more then your competition. You can’t just sit back and expect to be the #1 ranked site anymore. I have really enjoyed my experience with Investor Carrot and HIGHLY RECOMMEND them to anyone and everyone. I seriously want to model their company blue print when I introduce my next product. Really proud of you and what you’ve been able to do the past year… and the “stick to it” mindset you’ve got. More than anything… what I hope comes across to people in this article is the mindset it takes to be successful as an entrepreneur. feel that separates people who are successful from those who aren’t. Able to focus and willing to invest for the long-term. basic SEO stuff that we have in our 3 Lead Per Day training. Great work! Great work man! Really proud of you and we’re here for ya to help you take it to the next level! Just so people are very clear… Scott wanted to test things out to see how well they could do setting up their own site from scratch, writing their own content, getting it ranked, etc. They did a great job! And he worked hard on it and has invested a good amount into it $3,750 and counting… and dozens of hours. There is someone actively doing the SEO on that non-Carrot website at a rate of $350/mo.. which is why the website has ranked faster in some keywords than the Carrot site (the Carrot site didn’t have anyone actively working on the SEO… it was just the default settings on our system that helped get Scott there). So if Scott were to invest that SEO work into Carrot as well, he would have gained his rankings on Carrot much faster. But a big key here is which one is getting the highest ROI and the best net results? So thats what people should base their decision on. What option will yield the best NET results to you considering your time and your money? Whatever is the best fit for you, Carrot or non-Carrot, go that route. Great work Scott! Glad to have you as an awesome Carrot member!!!! Thanks for chiming in Trevor. You make some good points and thanks for clearing up some things that might not have been clear. In the end no matter what direction a person wants to go with their website, they should expect a lot of work. More importantly though is you need to have a plan, stick with it and be patient. The great thing about website marketing is that each effort builds upon the last effort. You can build your momentum slowly and over time. That’s what I love about it because it fits the way I have to work. Hi Scott, I use investor carrot up here in Toronto, Canada. I use to find tenant / buyers for rent to own leads. The site converts very well, and I found my first lead which I sell to a rent to own company. Great review. Great to hear from someone who uses the Tenant/buyers site template. I’m not surprised it converts well for you. These sites do a really good job at that. What modifications have you done to your website? Thanks for taking the time to perform such a thorough review. I plan on going all-in starting tomorrow (Jan 1), so this was a great review. I didn’t realize it would take so long to get the website ranked onto the first page (or so much work). One advantage I might have is I don’t have a lot of competition in my market area right now, so maybe, just maybe, it will come a little sooner. It is very possible to rise to the first page much quicker if your market is not competitive. You could do it in a few months, heck I’ve seen it happen in weeks. Just don’t get your hopes up. Take a look at your competitors and remember you just have to do better then them. You can always go ultra targeted and you’ll eliminate even more competition. And you are very welcome for the review. Sometime this year I’ll put together an update to the review so you all can see how I’m progressing. Welcome on aboard the Carrot Community!!!! Yes, Scotts review rocks. The part I love about it is how it’s objective in that he compared it against another non-carrot site and so far the results speak for themselves! On the SEO side of things… ya it really depends. Sometimes we’re amazed how fast customers are able to rank for terms. As an example… one of our members who joined in December… one of the top wholesalers in Detroit who has up to now only done offline stuff… joined Carrot. He implements like crazy so he had his sites up, domain attached, and the branding, etc. done within an hour. Then he dove into the 3 Lead Per Day training upgrade and launched a few videos and followed our steps to optimize them… within 2 weeks he had his first lead and he’s dominating w/ his videos, Carrot website, and classified ad listings for a really great term in the Detroit market for buying inherited houses. So ya, it can happen quicker. Just takes focused implementation. The biggest thing you can do is make sure to tweak the content on your home page a bit to differentiate it. Hit us up if you need any help at all!!! We’re here for ya. I not only enjoyed your review, but received great value from it. I appreciate your open discussion when you compared your IC sites with your independent site. I see this as a concern as well, i.e. if for some reason IC went off line, then your business would greatly suffer. Having another site not connected to IC will help insure your business will continue without to much interruption. I would certainly be interested in your update to this review at some point in the future. Please alert me when that happens. Also I am not a current member of IC. I plan to join soon. When I do, I will purchase through your affiliate link. I want you to receive credit for the work you have done. I have some additional questions, but I will contact you through your Struggling Investor contact link. Thanks for the kind words about my article Don. I’m glad you were able to get some valuable information out of it and hope that it helps you make a decision. I plan on doing an update this spring about how my sites are doing. One quick question. How did you create the 20 city specific pages? “Added 20 City Specific Pages. After talking with Aaron (Investor Carrot SEO manager) and Trevor, they recommended created separate pages for cities in your target market. These pages should be duplicates to your home page, but change the target market. For me my target area is New Jersey, so I came up with 20 cities in NJ that I wanted to micro target (Morristown, Phillipseburg, Trenton,etc…). I then made exact copies of the homepage and for each replaced every where that New Jersey showed up with the city name I wanted to target. You rock, dude. Thanks for sacrificing your time to do the review and answer questions. Anytime Brad! In the coming months I’ll be updating my review as well, so keep an eye out for it. Scott were you able to integrate your Carrot site with your Podio account? Hey Scott. Would you recommend someone starting out at wholesaling and marking for deals to set up an OnCarrot landing page for $50/mo? I was talking to the owner of a large investment company locally and he recommends that the first thing I should do is set up a page with OnCarrot before even sending any mailers. I know in a 2011 post, you made a blog about a website not being necessary, but that was 2011. I was wondering if you still feel the same way. My feeling is that I would definitely start up a website in the beginning if you can afford the cost. I say this because one of the factors in Googles’ rankings is the age of your site. A more established website will out rank a similar website that is younger. If you can start up your website in the beginning, in a year you’ll have a site that you can then leverage and pull in some leads from. You may not have time to actually work on a website at first. So that is why I recommend getting an investor carrot website because all the upfront hard work that is needed for a website is already done for you. Then to get the website to the next level (ranking highly in search results) you just have write an article each month, create citations and work on driving traffic to your site. All this can be done when you have the time. You can also hire this stuff out like I do. After 2 years of having my website I get 40 to 50 leads per month. That’s a great secondary source of leads that now is very minimal work for me. Again though, have a website is not a “MUST”, but I do recommend it. Great post. Wouldn’t recommend for someone who wants to close a deal there first week of business but totally needed if you want the credibility factor and long term results. Don’t do it if your strapped for cash. Scott, do you feel that it’s a must now for aspiring investors to invest in a website in 2018? We’ve been doing house flipping for a few years and just recently as of late last year (2017) pulled the trigger on launching a website for branding and credibility and of course the leads. Prior to this, we worked the county lists, etc. which worked out well but we wanted to do even more. Whats a realistic number of leads one could generate online? I’m a bit biased because I love all things internet, so I would say Yes. It helps control the narrative about your company. Everyone is going to search online in an effort to do some research on your company. When I research a contractor or other tradesman I always feel more comfortable dealing with the person who has a full blown website. I always get an off feeling of the only information I’m finding is from Yelp or some other 3rd rate review site or some business directory. They all seem like spam. You know what I mean? PLUS, if you work at it over time a website can start to generate consistent leads for you. In my market, 5 years ago, I was able to start getting leads after about 9 months. At the peak of my website I was getting about 20 to 25 leads per month. I know people who get way more and I know people who get zero. It really all depends on how much work you put into your website, seo and if you choose to do paid advertising. You have to outwork the other websites in your market. If you aren’t in the top 5 in google for a keyword, you won’t get much at all. What I love about Investor Carrot is that it gives you the headstart on your website, plus tools and training to get to the top spots in google and more.